This course was established in 2012. 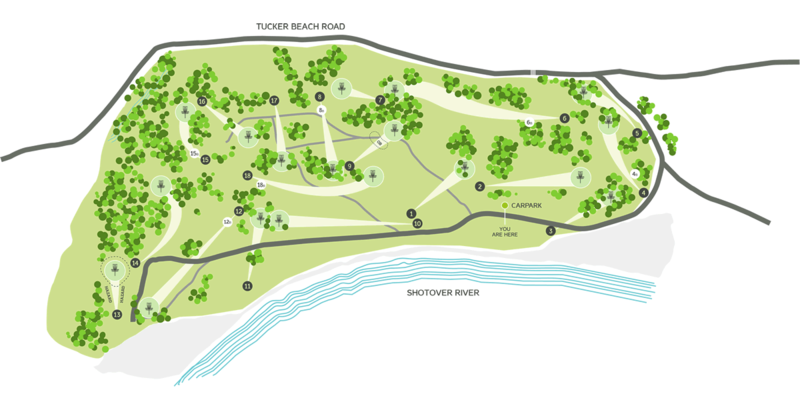 It is a figure 8 course, going anti clockwise then clockwise around the Tucker Beach Recreation Reserve beside the Shotover River. The course is relatively long, at 1928 m (6325 ft), with five holes over 122 m (400 ft), including a par 5 at 255 m (837 ft). The course is largely flat, with clusters of willow trees and many wide open spaces. All tees are marked by large white quartz stones and there is appropriate directional signage. A course map can be downloaded above. The course is located about 20 minutes drive from Queenstown. Follow State Highway 6 through Frankton, towards Arrowtown, then turn left onto Tucker Beach Road just before the long sweeping bridge over the Shotover River. Go to the end of the road, across the cattle grate, down the hill and veer right at the fork with a green “No Camping” sign. Follow it around until parallel with the river, where there is a parking area beside the large sign. The 1st and 10th tees, marked by three piles of large white stones, are in an open area on the right side of the road, about 100 m past the car park. Please respect our course, the surroundings and other people using the area. Please read about the rare dotterel birds on the big sign and observe dog leash requirements during the breeding season. Pick up and pack out all rubbish thanks.